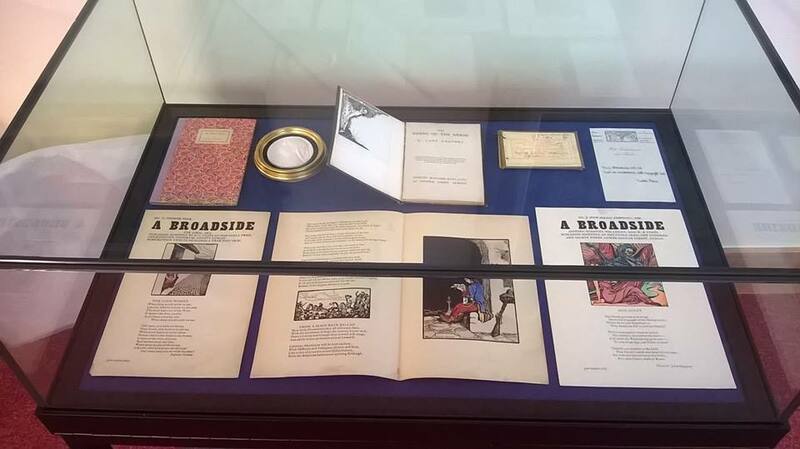 Monday 13th June saw the official opening of Yeats and the West: an exhibition of western worlds. Coinciding with the launch of the Galway International Arts festival, the exhibition was opened in style with the help of some very special guests, including the poet Moya Cannon. Noting the impact of local landscape on the poet’s work, the Director of the Moore Institute, Professor Dan Carey, hosted the event, which took place in the midst of the exhibition space in the Hardiman Research Building. He gave warm thanks to staff at the James Hardiman library and the Moore Institute and especial thanks for the donation to the exhibition of two oil paintings, perhaps the highlights of Yeats and the West and only rarely seen: The Good Grey Morning by Jack B. Yeats, featuring a late self depiction of the artist looking out the window from his studio, and The Moon Worshippers by Gerard Dillon, with its astonishing primitivist Connemara landscape. 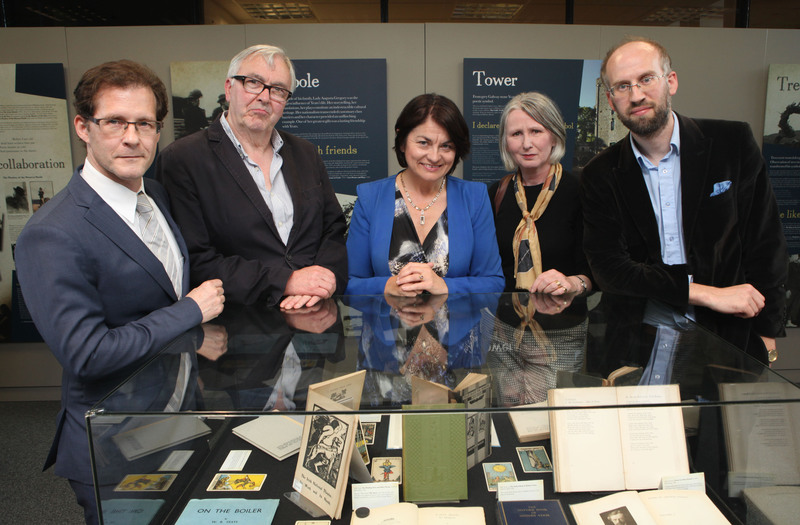 Prof. Daniel Carey, Ronnie O’Gorman, Sen. Fidelma Healy Eames, Sen. Susan O’Keeffe, and Dr. Adrian Paterson, at the launch of Yeats & the West at the Hardiman Research Building, NUI Galway, 13 July 2015. The exhibition features many talks and special events throughout its run until December 2015 and has free admission. The President of NUI Galway, Dr Jim Browne, registered Yeats’s worldwide importance and local meaning as craftsman and folklorist. He argued that the exhibition was essentially about collaboration, creativity and community, and stressed the importance of all three of these elements to the Yeats family and to the university. ‘The revolution that happened here in the west’, he said, ‘shaped not only modern Ireland but the western world’. He singled out Jack Yeats’s 1900 Galway Sketch book, owned by the University, and newly on display for Yeats and the West, which features sketches of local figures and landscapes at Coole Park and Galway Races, as a fine example of the worldwide impact of local aesthetics. Barry Houlihan, co-curator of the exhibition, pointed further west, to North America, highlighting the significance of this western world for Irish culture. He described Yeats’s own lecture tours, and the tours of the Abbey Theatre players, which finally took many of them to Hollywood. Yeats’s 1932 letter dropping his own play The Words Upon the Window Pane from the repertoire, as making less sense to American audiences unaccustomed to Jonathan Swift, expressed, he said, the ready compromise between aesthetic and commercial considerations necessary for a working theatre. 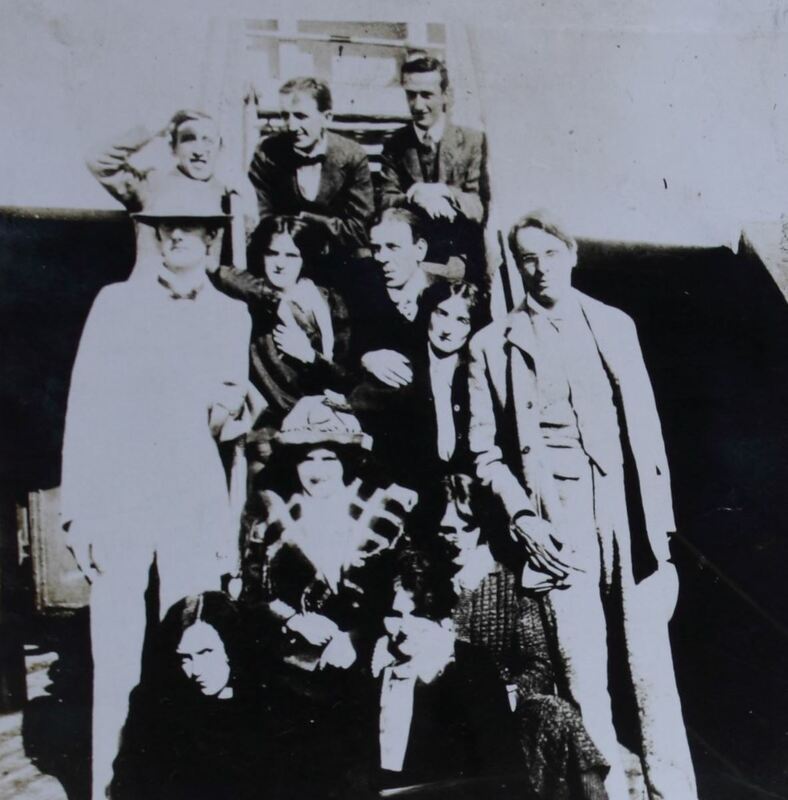 Abbey Theatre American tour participants including Lennox Robinson (l) and W.B.Yeats (r). Dr Adrian Paterson, curator of the exhibition, articulated how local community collaborations could have worldwide implications. 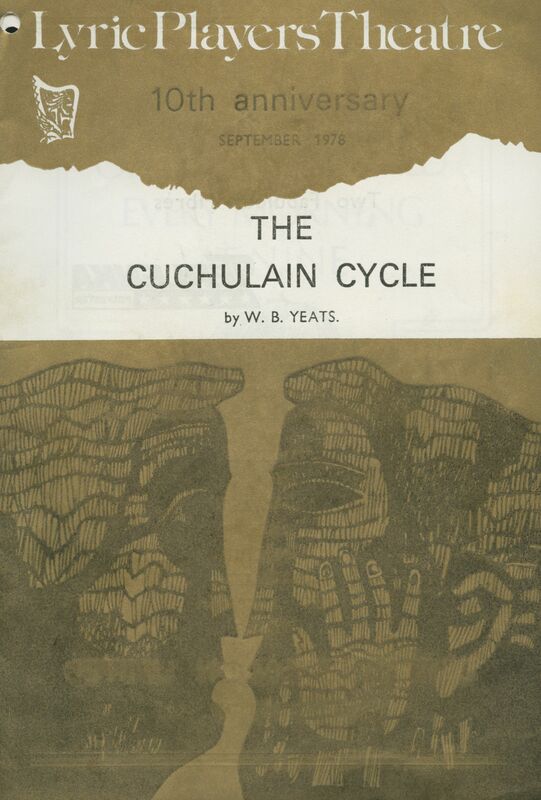 The west, he argued, ‘was the landscape of Yeats’s poetry and plays’. With its wellspring of songs, stories, language, artwork, drama, crafts, it was for Yeats the foundation of the Irish imagination. Moreover, ‘significant events of his life took place here; collaborations that shaped his work were forged here’. The August 1902 Killeeneen Feis in honour of ‘Raftery, Connaught poet’ not only brought together different community centred arts, poetry, plays, storytelling, singing and dancing, but Jack Yeats’s fine illustrations, reproduced in the exhibition, caught the presence of John Quinn, New York lawyer benefactor of modernism, and the man whose gift that week of a volume of Nietzsche to W.B. Yeats changed the course of modern poetry. He thanked the bountiful generosity of lenders to the exhibition of some fabulous materials: the Berg Collection, the Bodleian library, and in particular the National Library of Ireland for Yeats manuscripts, and St Brendan’s Cathedral Loughrea for its Dun Emer Saints banners (like St Brendan above) highlighting the craft and embroidery of the Yeats family. Local collaborations and places mattered not only to the Irish Revival, he suggested, but today. Kiltartan Musuem, Coole Park, and the landmarks along the Lady Gregory-Yeats trail, above all Thoor Ballylee, had importance then as now as giving rise to creativity. He welcomed in particular Senator Fidelma Healy Eames and members of the Yeats Thoor Ballylee Society, who were doing so much to preserve and promote the landscape and architecture of Yeats’s poetry, and a place that influenced so many of Yeats’s most telling poems. Citing Yeats’s ‘my glory was I had such friends’, he gave especial thanks to collaborators who are or have become friends: colleagues at the English department such as Prof. Adrian Frazier and Dr Rebecca Anne Barr; at the library, Marie Boran, Aisling Keane, and Niall McSweeney, photographers Deirdre Holmes and Nicholas Feve, the designer Mel Durkan from proviz.ie, John Conway of Bulabosca films who made the marvellous video, and in particular an exemplary co-curator in Barry Houlihan. 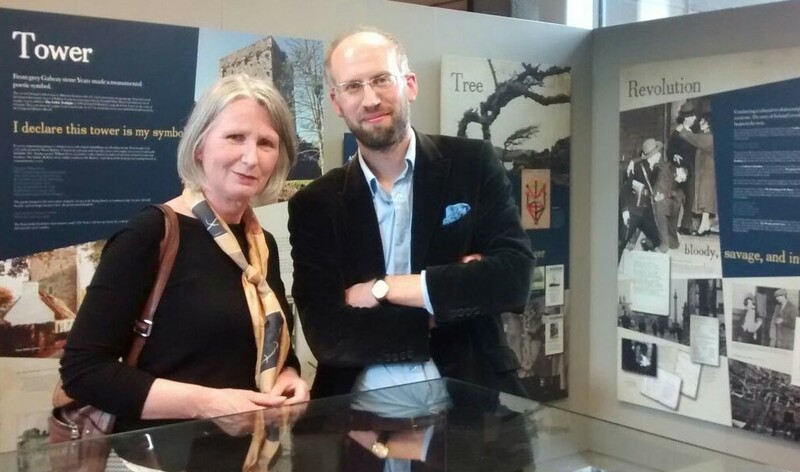 Senator Susan O’Keeffe, chair of Yeats2015, with Yeats and the West curator, Dr Adrian Paterson. Senator Susan O’Keeffe, chair of Yeats2015, who had found time to be present notwithstanding her work at the banking inquiry, explained that key local events like the Yeats and the West exhibition were part of a larger chain, a worldwide series of creative and cultural events happening in honour of the poet’s 150th birthday, in places as far-flung as Tokyo, Seoul, Beijing; in Melbourne, Moscow, and Madrid; in Istanbul, Paris, Utrecht; in New York, Washington and Atlanta, and closer to home in London, Dublin, Sligo and in Galway. She gave thanks to the curators, Barry Houlihan and Adrian Paterson, and stressed the vital importance of education, and lively and informative shows like this one, in bringing Yeats to a new generation of poetry lovers. The poem is part of Moya Cannon’s forthcoming new collection from Carcanet, Keats Lives, which might, she noted, have equally been Yeats Lives. John Cox, Librarian, closed the event and gave thanks to all present, reminding us that the James Hardiman Library’s fine collections for readers and scholars make up the backbone of the exhibition, such as the Lady Gregory Collection, the Arthur Shields Collection, the Colin Smythe Collection, the Thomas Kilroy Collection, and of course the theatre archives at NUI Galway including the Abbey Theatre Digital Archive, and that of the Lyric Theatre Belfast and the Druid Theatre. The exhibition, which features special events throughout its run, takes place at the Hardiman Research Building, NUI Galway, and is open Mon – Sat 9-5 till December 2015, with free admission.